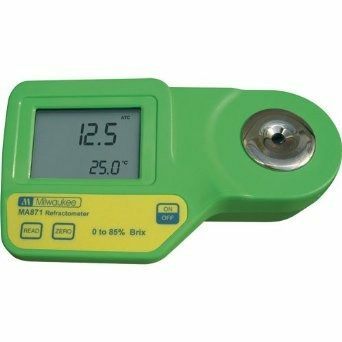 The MA871 Digital Sugar Refractometer measures refractive index to determine the % Brix of sugar in aqueous solutions. Features large, easy-to-read LED screen. The MA871 is an optical instrument that employs the measurement of refractive index to determine the % Brix of sugar in aqueous solutions. The method is both simple and quick. Samples are measured after a simple user calibration with deionized or distilled water. Within seconds the instrument measures the refractive index of the sample and converts it to % Brix concentration units.